Picture from wicklore : Anyone want to play 'count the masts'? Picture: Anyone want to play 'count the masts'? Taking advantage of a half day on this miserable rain-lashed Friday I decided to take a look at Saggart Hill. I was curious why no one had posted a report before, and why only one member had even claimed climbing it. Feeling like a pioneer braving a new frontier I donned my waterproofs and set off. At Brittas on the N81 (about 10 minutes drive out of Tallaght) I took a right and found my way to the forestry road at O014 225 F (OS map 50). Walking up the forestry road I passed loggers and the inevitable "Do not Climb on Timber Stacks" signs. The rough road led to the top in about 10 minutes. There were three junctions along the track and I simply took the uphill option each time. My pioneering hopes were dashed as I reached the most industrialised hilltop I have ever seen. At every turn there were masts, transmitters, buildings, spiked fences and, believe it or not, security cameras. I counted about 10 masts of various sizes, enclosed in separate compounds. It was like Ballymount Industrial Estate up there, and I wondered if security staff would appear from the many structures to chase me off. The summit is relatively flat. 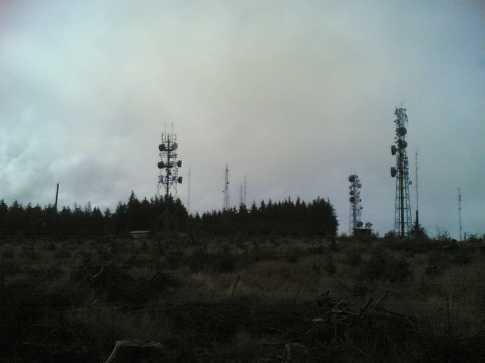 It was obviously cleared of forestry in the past to make way for the masts and buildings. I think the bulldozers just pushed everything to the north and east, making the ground there difficult to walk on. I searched in vain around the hilltop for a redeeming feature, but even the ringfort to the east of the "summit" was a sad affair, barely discernible from the surrounding wasteland. A forlorn looking dead tree stands over it for those of you seeking it. The views out to the east and south would be great in clear weather. Even with the rain and cloud I could see across to Seahan and Corrig and further south to Sorrell and beyond.